Senegal, a country South of the Senegal River in Western Africa bounded by Mauritania, Mali, Guinea, Guinea-Bissau, Gambia, and the Atlantic Ocean has a total land area of 76,000 square miles and a population of around 14 million. Its topography is mostly rolling sandy plains and its climate tropical with distinct dry and humid seasons. Senegal receives international development aid to combat unemployment, gap between the rich and the poor, and juvenile delinquency. The major sectors of its economy are food processing, mining, cement, textiles, tourism and oil refinery. The best time to visit Senegal is Noveber through April. Senegal caters to various tourist markets – cultural, ecotourism, bird watching, historical, beach, sports, or natural sites. The major attractions are Dakur, Goree, Saint-Louis, Cayar (Pink Lake), Casamance and the Delta Islands. It is also a thriving arts center set in a tropical environment. Its cuisine is influenced by France, and Portugal. Seafood, chicken, lamb, beef, lentils, and vegetables are consumed as stews along with rice, coucous, or bread. The French influence is most felt in the dessert area which can be very rich and sweet. 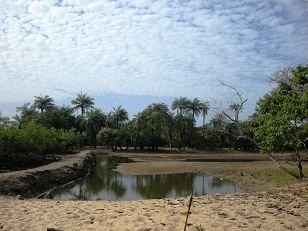 Lonely Planet The Gambia and Senegal 978-1741048292 $17 328 pages. The first half is The Gambia and the rest is Senegal. Excellent coverage of Senegal especially suitable for budget travelers. Senegal and The Gambia Map by International Travel Maps 978-1553413905 $12 1:800,000 Scale. Includes Inset Map of Dakar, Central Dakar, Ile de Goree, and City of Banjul. The first stamps of Senegal were a set of eight stamps released in 1887 that were surcharge (5) overprints on stamps of French colonies. The set (Scott #1 to #8) catalogs for around $3000 mint or used. A variety showing surcharge (10) overprints were also issued and that set (Scott #9 to #20) catalogs even higher at around $7K mint or used. A couple of other surcharge (15 and 25) overprints formed the primary issues of Senegal during the period till 1892. Those sets are also very valuable. The most valuable one among them is a red ‘Senegal’ surcharge (75) overprint (Scott #33) that catalogs for around $10.5K mint and around $4K used. Senegal released a long set of eighteen stamps between 1892 and 1900 that were key types that showed the Navigation and Commerce Allegory. The set (Scott #35 to #52) catalogs for around $200 mint and around $150 used. A couple of surcharge overprints on the same design were also issued during the period till 1912. Senegal released a long set of eighteen key types in 1906 with the ‘Senegal’ inscription in red. The set (Scott #57 to #72) catalogs for around $200 mint and around $140 used. The designs show General Louis Faidherbe, oil palms, and Dr. Noel Eugene Ballay. Senegal released another long set of thirty stamps between 1935 and 1940 showing local scenes. The set (Scott #142 to #171) catalogs for around $30 mint and around $12 used. The designs show Faidherbe Bridge at St. Louis and Diourbel Mosque. A set of six stamps released in 1960 in the Animals theme following the establishment of the Republic. The set (Scott #195 to #200) catalogs for around $6 mint and around $2 used. The designs show roan antelope, savannah buffalo, wart hog, giant eland, bushbuck, and Defassa waterbuck. Stamps of French West Africa were used in Senegal during the period from 1944 to 1960. Senegal along with French Sudan merged to form the Mali Federation and became independent on June 20, 1960. The federation broke up and Senegal gained independence as a separate country on August 20, 1960. A set of four stamps and a souvenir sheet of four released on January 31, 1981 in the National Park Wildlife theme. The set (Scott #541 to #544 and #545a-d) catalogs for around $30 mint and around $20 used. The designs show Caspian tern and sea gulls of Kalissaye Bird Sanctuary, laughing gulls and Hansel’s tern at Barbarie Spit, turtle and crab at Madeleine Islands, and cormorant of Madeleine Islands. A set of four stamps released on December 29, 1998 in the Endangering Marine Fauna theme. The set (Scott #1334 to #1337) catalogs for around $3 MNH and around two dollars for used. The designs show net fishing, sewage and pollutants in the sea, using dynamite for fishing, and oil slicks released from tanker ships. A set of two stamps released on January 16, 2005 to mark the 27th Paris-Dakar Rally. The set (Scott #1575 to #1576) catalogs for around $4 MNH or used. The designs show automobile, motorcycle, and truck in a rally setting. Senegal has released a number of sets over the years to mark the rally. The sets catalog for a slight premium over regular issues and form a good collectible theme. The first coins of Senegal were Republic Standard Coinage 0.0926 troy ounce Gold Proofs issued in 1968 to mark the eighth anniversary of independence. The design shows star above shield within wreath in Obverse and Stars above value and date in Reverse. It is valued at close to bullion value. Senegal has issued a number of commemorative coins (some very large) over the years. Coins $3 and up Recent Francs in UNC starts around $3. Rare High Value UNCs, Silver Essais, etc start around $50. Low mintage silver and gold proofs go well into the 100s. Paper Money $5 and up Common UNC banknotes starts around $5. Early Large Notes in VF+ starts around $20. Colonial issues from the 1910s in VF+, UNC Bundles, etc go well into the 100s. Art $10 and up 19th century and older local scenes and certain original works start around $10. Kasheta bird paintings, vintage statues, etc start around $30. Authentic Masks and Sand Paintings start into the $100 range. Antiques $25 and up Original 19th century maps start around $25. Older maps, Jasper bead necklaces, etc go into the 100s. Miscellaneous Collectibles $2 and up Vintage local scenes postcards start around $2. Parrot Glass Bead Bracelets start around $50. Order of the Lion Knight Medals, Order of National Merit Medals, Commander Crosses etc go well into the 100s.